Simply the best wildlife experience. Get close to the action with our privileged access to special viewing stands. 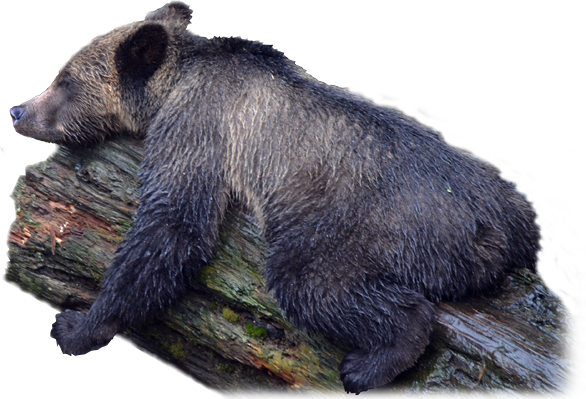 Explore the pristine natural world of British Columbia’s coastal grizzly bear. 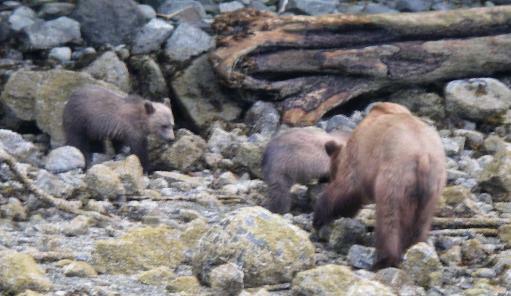 Yes this is an evening black bear tour and this is a mother grizzly bear with two first year cubs. This bear spent most of the summer in an area that was less then a twenty minute boat ride from the lodge. Some mornings she was observed on the way to the whales and other evening on a black bear tour. This evening we followed them along the shore for close to an hour which extended our evening tour so we got back just before dark. Our lodge does not have a tight schedule requiring us to be back at the lodge at a set time so if we find something worth watching, we watch.